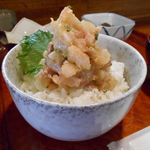 "KITUNE-NO-BOTAN(きつねのぼたん)" - Miso based fish tartar set"NAMERO" meal is excellent! I went to "KITUNE - NO - BOTAN" who is reputed that fish dishes are delicious at Ohmishima. The "NAMEROU" (rice bowl of tartar horse mackerel) was a delicious taste coming out as I chew it, and it was very delicious. Furthermore, the young couple spoke frankly and it was a very atmosphereful shop.